On the day the Gjallerhorn is blown, it will wake the gods, no matter where they are, no matter how deeply they sleep. 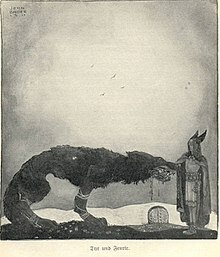 Ragnarök, in Norse mythology, is a series of prophesied events, including a great battle and various natural disasters, foretold to ultimately result in the death of a number of major figures (including the gods Odin, Thor, Týr, Freyr, Heimdallr, and Loki). Odin gave the Gjallerhorn to Heimdall, watchman of the gods. On the day the Gjallerhorn is blown, it will wake the gods, no matter where they are, no matter how deeply they sleep. Heimdall will blow the Gjallerhorn only once, at the end of all things, at Ragnarok. Ragnarok is coming. When the sky splits asunder and the dark powers of Muspell march out on their war journey, Frey will wish he still had his sword. Now I shall tell you of the days to come. I shall tell you how it will end, and then how it will begin once more. These are dark days I will tell you of, dark days and hidden things, concerning the ends of the earth and the death of the gods. Listen, and you will learn. This is how we will know that the end times are upon us. It will be far from the age of the gods, in the time of men. It will happen when the gods all sleep, every god but all-seeing Heimdall. He will watch everything as it begins, although he will be powerless to prevent what he sees from happening. I am sorry... but I do believe that Loki is loose. The signs show it. Now anything can happen. We enter the Twilight of the Gods. Ragnarok comes. Our world ends. I had no objection to calling Armageddon by the name 'Ragnarok'. Jesus or Joshua or Jesu; Mary or Miriam or Maryam or Maria, Jehovah or Yahweh — any verbal symbol will do as long as speaker and listener agree on meaning. But Loki? Ask me to believe that a mythical demigod of an ignorant, barbarian race has wrought changes in the whole universe? Now, really! This page was last edited on 10 April 2018, at 05:58.